If you drink wine, the wines of Bordeaux need little introduction. There are the First Growths that collectors clamor over and there are the AOC classified dry, medium-bodied red wines and white wines that are affordable but also somewhat generic. At Vin de Jardin (Garden of Wine), the goal is to make a wine that is bright, fresh, easy to drink and does not taste like all the others. Winemaker Marco Pelletier and his partners Jean Terrade and Gérard Pantanacce wanted a wine that displays power but is balanced. With Vin de Jardin, they have done that. Marco Pelletier was born in Canada. Working as a civil engineer, he came to France in 1997 where he first fell in love with wine. He took a sabbatical and worked harvest in Champagne. “Bit by the wine bug,” Pelletier decided that he no longer wanted to work as a civil engineer and applied to a sommelier program in Canada. Denied acceptance at first, Pelletier persevered, and when there was a cancellation, he took the spot. He may not have been a first choice at the school but subsequently he excelled and won a scholarship. Pelletier worked as a sommelier in the private chateau for the president of Relais en Chateaux, followed by a four-year stint at two Michelin starred restaurant Maison Rostang in Paris under Chef Michel Rostang. Pelletier spent six years as head sommelier at the three-star Michelin restaurant Le Taillevent where he oversaw 400,000 bottles in the cellar. He next worked at Le Bristol in Paris for eight years. With this impressive pedigree, Pelletier opened Vantre, his own Parisian restaurant one year ago. Vantre is a classic bistro with a large wine list that includes wines from his private cellar that he has been collecting for years. During his time as a sommelier, Pelletier also became a winemaker. He had become friends with Jean Terrade and Gérard Pantanacce, who previously owned a wine bar in Paris. Terrade and Pantanacce, both 77 years old, owned one-and-a-half hectares of virgin soil with a house. After over-imbibing one night in 2002, they decided to plant on the property. They had planted without a permit but a neighbor who had the right of plantation helped them, and by 2007 they started vinification. When they made the 2008 vintage, they made vinegar, not wine. They reached out to Pelletier who began helping them in 2009. Today, they have nine different grapes planted on one hectare. For white grapes, they have sauvignon blanc, sauvignon gris, muscadelle and semillon. For red grapes, they have merlot, cabernet sauvignon, cabernet franc, petit verdot and carmenere. In the vineyard, the yields are low with six or seven clusters per foot. The grapes are picked early when they are firm with high acidity. Compared to neighbors who pick by machine and can cover one hectare in 10 minutes, their one hectare is picked by hand and takes 26 harvesters three days to pick the grapes. In the winery, Pelletier uses natural yeasts and preserves and stabilizes with a minimal quantity of sulfites. Vin de Jardin produces approximately 5,500 bottles per year. The wines are bright with aromatic complexity and they are different from other wines in Bordeaux. The wines of Vin de Jardin are not classified as AOC wines but rather they are declassified to Vin de France, the designation for a table wine from France. This allows the team flexibility to make the wine that they want to make. Vin de Jardin Domaine de Galouchey 2013 and 2014 ($32) – For the Vin de Jardin Domaine de Galouchey, all the grapes that they grow, both red and white except sauvignon blanc, are blended into this wine. The wine is then placed in old oak for a long period of aging. The wine naturally experiences micro-oxidation and the tannins lose a bit of their edge. The 2013 wine is juicy and approachable with a refreshing quality to the wine that can be attributed to 1-2 percent of sauvignon gris. The tannins are integrated and the texture is soft. The 2014 is darker and firmer than the 2013. Vin de Jardin Les Cabernets 2014 ($36) – Made with a blend of cabernet sauvignon and cabernet franc, this wine has notes of dark plum, black cherry and licorice with a hint of graphite. Marco Pelletier is bringing his new vision of Bordeaux wine to life at Vin de Jardin. The natural wines of Vin de Jardin are enjoyable to drink while also being affordable. 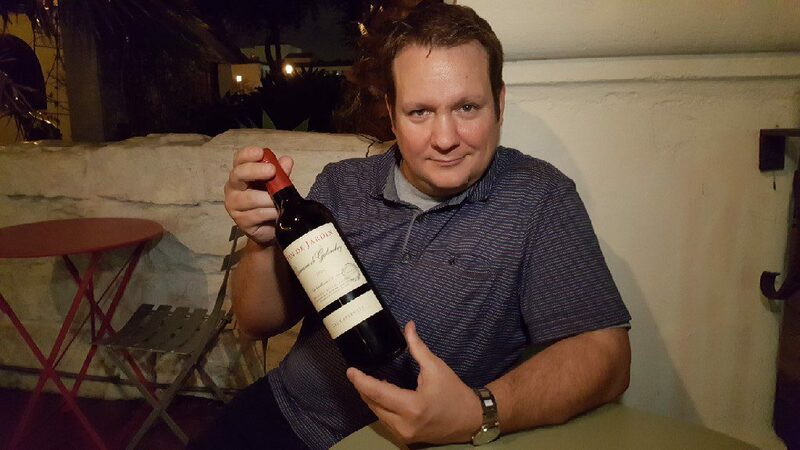 This entry was posted in Wine and tagged Bordeaux, Marco Pelletier, Napa Valley Register, Vin de France, Vin de Jardin, Wine by Allison Levine.